The President of the United States of America has declared September 11 each year a day of national mourning to be honored with all American Flags at half staff from sunrise to sunset on that day. On Patriot Day, we honor the nearly 3,000 innocent lives taken from us on September 11, 2001, and all of those who so nobly aided their fellow citizens in America’s time of need. We rededicate ourselves to the ideals that define our country and unite us as one, as we commemorate all the heroes who lost their lives saving others. September 11, 2001, will forever be one of the most tragic days in American history. Through the unimaginable despair, however, ordinary Americans etched into our history remarkable illustrations of bravery, of sacrifice for one another, and of dedication to our shared values. The shock from the indelible images of the smoke rising from the World Trade Center and Pentagon gave way to countless inspiring videos of co-workers helping one another to safety; of heroes running into collapsing buildings to save the innocent people trapped within; and to the unforgettable story of the patriots who charged the cockpit of Flight 93 to save untold numbers of lives. These heroes moved us with their bravery. They make us proud to be Americans. Throughout history, everyday Americans and first responders have done the extraordinary through selfless acts of patriotism, compassion, and uncommon courage. Not just in New York, Virginia, and Pennsylvania, but across our great Nation, Americans on September 11, 2001, bound themselves together for the common good, saying with one voice that we will be neither scared nor defeated. The enemy attempted to tear at the fabric of our society by destroying our buildings and murdering our innocent, but our strength has not and will not waiver. Americans today remain steadfast in our commitment to liberty, to human dignity, and to one another. It has been 16 years since the tragedy of September 11, 2001. Children who lost their parents on that day are now parents of their own, while many teenagers currently in high school learn about September 11th only from their history books. Yet all Americans are imbued with the same commitment to cause and love of their fellow citizens as everyone who lived through that dark day. 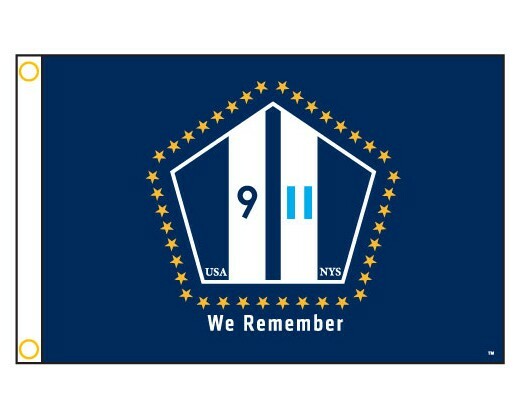 We will never forget. The events of September 11, 2001, did not defeat us. They did not rattle us. They, instead, have rallied us, as leaders of the civilized world, to defeat an evil ideology that preys on innocents and knows nothing but violence and destruction. On this anniversary, I invite all Americans to thank our Nation’s incredible service members and first responders, who are on the front lines of our fight against terrorism. We will always remember the sacrifices made in defense of our people, our country, and our freedom. The spirit of service and self sacrifice that Americans so nobly demonstrated on September 11, 2001, is evident in the incredible response to Hurricanes Harvey and Irma. The same spirit of American patriotism we movingly witnessed on September 11th has filled our hearts as we again see the unflinching courage, compassion, and generosity of Americans for their neighbors and countrymen. The service members and first responders who lost their lives on September 11, 2001, and in the years of service since would be proud of what we have all witnessed over these last three weeks and what will undoubtedly unfold in the coming months of recovery. By protecting those in need, by taking part in acts of charity, service, and compassion, and by giving back to our communities and country, we honor those who gave their lives on and after September 11, 2001. NOW, THEREFORE, I, DONALD J. TRUMP, President of the United States of America, do hereby proclaim September 11, 2017, as Patriot Day. I call upon all departments, agencies, and instrumentalities of the United States to display the flag of the United States at half-staff on Patriot Day in honor of the individuals who lost their lives on September 11, 2001. I invite the Governors of the United States and its territories and interested organizations and individuals to join in this observance. I call upon the people of the United States to participate in community service in honor of those our Nation lost, to observe this day with appropriate ceremonies and activities, including remembrance services, and to observe a moment of silence beginning at 8:46 a.m. Eastern Daylight Time to honor the innocent victims who perished as a result of the terrorist attacks of September 11, 2001. As we remember all those we lost on that day and the Americans who made the ultimate sacrifice in the wars that followed, we must strive to carry forward their legacy. On this National Day of Service and Remembrance, we take up their unfinished work and pay tribute to their lives with service and charity. Through these acts and quiet gestures, we can honor their memory and reclaim our sense of togetherness. I encourage all Americans to visit www.Serve.gov orwww.Servir.gov to learn more about service opportunities across our country. In the face of great terror, some turned to God and many found comfort in family and friends -- but all Americans came together as one people united not only in our grief, but also in our determination to stand with one another and support the country we love. Today and all days, we remember the patriots who endure in the hearts of our Nation and their families who have known the awful depths of loss. In their spirit, let us resolve to move forward together and rededicate ourselves to the ideals that define our Union as we work to strengthen our communities and better our world. NOW, THEREFORE, I, BARACK OBAMA, President of the United States of America, do hereby proclaim September 11, 2014, as Patriot Day and National Day of Service and Remembrance. I call upon all departments, agencies, and instrumentalities of the United States to display the flag of the United States at half-staff on Patriot Day and National Day of Service and Remembrance in honor of the individuals who lost their lives on September 11, 2001. I invite the Governors of the United States and its Territories and interested organizations and individuals to join in this observance. I call upon the people of the United States to participate in community service in honor of those our Nation lost, to observe this day with appropriate ceremonies and activities, including remembrance services, and to observe a moment of silence beginning at 8:46 a.m. Eastern Daylight Time to honor the innocent victims who perished as a result of the terrorist attacks of September 11, 2001. IN WITNESS WHEREOF, I have hereunto set my hand this tenth day of September, in the year of our Lord two thousand fourteen, and of the Independence of the United States of America the two hundred and thirty-ninth. On September 11, 2001, amid shattered glass, twisted steel, and clouds of dust, the spirit of America shone through. We remember the sacrifice of strangers and first responders who rushed into darkness to carry others from danger. We remember the unbreakable bonds of unity we felt in the long days that followed -- how we held each other, how we came to our neighbors' aid, how we prayed for one another. We recall how Americans of every station joined together to support the survivors in their hour of need and to heal our Nation in the years that followed. On September 11, 2001, a bright autumn day was darkened by the worst attack on the American people in our history. Thousands of innocent men, women, and children perished when mighty towers collapsed in the heart of New York City and wreckage burned in Pennsylvania and at the Pentagon. They were family and friends, service members and first responders -- and the tragedy of their loss left pain that will never fade and scars our country will never forget. Today, as we remember the victims, their families, and the heroes who stood up during one of our country's darkest moments, I invite all Americans to reclaim that abiding spirit of compassion by serving their communities in the days and weeks ahead. From volunteering with a faith-based organization, to collecting food and clothing for those in need, to preparing care packages for our men and women in uniform, there are many ways to bring service into our everyday lives -- and each of us can do something. To get involved and find a local service opportunity, visit www.Serve.gov, or www.Servir.gov for Spanish speakers. Even the simplest act of kindness can be a way to honor those we have lost, and to help build stronger communities and a more resilient Nation. By joining together on this solemn anniversary, let us show that America's sense of common purpose need not be a fleeting moment, but a lasting virtue -- not just on one day, but every day. In the aftermath of the terrorist attacks of September 11, 2001, the American people demonstrated that in times of hardship, the values that define us do not simply endure -- they are stronger than ever. As a Nation, we responded to unthinkable tragedy with an outpouring of service and goodwill. On that dark day, first responders rushed into a burning Pentagon and climbed the stairs of smoking towers on the verge of collapse, while citizens risked their own health and safety to prevent further heartbreak and destruction. As Americans, we came together to help our country recover and rebuild. Today, we pay tribute to the selfless heroes and innocent victims of September 11, 2001, and we reaffirm the spirit of patriotism, service, and unity that we felt in the days and months that followed. By volunteering our time and unique skills, we can enrich communities across our country, and together, we can strengthen our Nation to meet the challenges of the 21st century. In the days to come, I ask all Americans to join together in serving their communities and neighborhoods in honor of the victims of the September 11 attacks. Today and throughout the year, scores of Americans answer the call to make service a way of life -- from helping the homeless to teaching underserved students to bringing relief to disaster zones. I encourage all Americans to visit Serve.gov, or Servir.gov for Spanish speakers, to learn more about service opportunities across our country. As we join in serving causes greater than ourselves and honoring those we lost, we are reminded of the ways that the victims of 9/11 live on -- in the people they loved, the lives they touched, and the courageous acts they inspired. On Patriot Day and National Day of Service and Remembrance, we pledge to carry on their legacy of courage and compassion, and to move forward together as one people. NOW, THEREFORE, I, BARACK OBAMA, President of the United States of America, do hereby proclaim September 11, 2011, as Patriot Day and National Day of Service and Remembrance. I call upon all departments, agencies, and instrumentalities of the United States to display the flag of the United States at half-staff on Patriot Day and National Day of Service and Remembrance in honor of the individuals who lost their lives on September 11, 2001. I invite the Governors of the United States and the Commonwealth of Puerto Rico and interested organizations and individuals to join in this observance. I call upon the people of the United States to participate in community service in honor of those our Nation lost, to observe this day with appropriate ceremonies and activities, including remembrance services, and to observe a moment of silence beginning at 8:46 a.m. Eastern Daylight Time to honor the innocent victims who perished as a result of the terrorist attacks of September 11, 2001. IN WITNESS WHEREOF, I have hereunto set my hand this ninth day of September, in the year of our Lord two thousand eleven, and of the Independence of the United States of America the two hundred and thirty-sixth. Nine years ago, the United States of America suffered an unprecedented national tragedy. On September 11, 2001, nearly 3,000 individuals from across our Nation and from more than 90 others, lost their lives in acts of terrorism aimed at the heart of our country. The Americans we lost came from every color, faith, and station. They were cherished family members, friends, and fellow citizens, and we will never forget them. Yet, against the horrific backdrop of these events, the American people revealed the innate resilience and compassion that marks our Nation. When the call came for volunteers to assist our heroic first responders, countless men and women answered with a massive rescue and recovery effort, offering hope and inspiration amidst tremendous heartbreak. Today we remember those we lost on that dark September day, and we honor the courage and selflessness of our first responders, service members, and fellow citizens who served our Nation and its people in our hour of greatest need. Throughout America, patriotism was renewed through common purpose and dedicated service in the days and weeks following September 11. Many joined our Armed Forces to protect our country at home and abroad; others chose to serve in their own neighborhoods and communities, lending their skills and time to those in need. Fences and boundaries gave way to fellowship and unity. In the wake of loss and uncertainty, Americans from every corner of our country joined together to demonstrate the unparalleled human capacity for good. To rekindle this spirit, I signed the Edward M. Kennedy Serve America Act last year, which recognizes September 11 as a National Day of Service and Remembrance. I called upon every American to make an enduring commitment to serve their community and our Nation. The response to that appeal has been inspirational, and last year more than 63 million Americans volunteered in their communities. I encourage all Americans to visit Serve.gov, or Servir.gov for Spanish speakers, for more information and resources on opportunities for service across America. By any measure, these myriad acts of service have strengthened our country and fostered a new wave of active and engaged citizens of all ages and walks of life. Americans should be particularly proud of the example set by our Nation's young people, who came of age following the horrors of September 11, yet still believe a truly patriotic idea: that people who love their country can change it. Through selfless acts for country and for one another, patriots in every corner of our Nation continue to honor the memory of those lost on September 11, and they reaffirm our charge to reach for a more perfect Union. By a joint resolution approved December 18, 2001 (Public Law 107-89), the Congress has designated September 11 of each year as Patriot Day, and by Public Law 111-13, approved April 21, 2009, the Congress has requested the observance of September 11 as an annually recognized National Day of Service and Remembrance. NOW, THEREFORE, I, BARACK OBAMA, President of the United States of America, do hereby proclaim September 11, 2010, as Patriot Day and National Day of Service and Remembrance. I call upon all departments, agencies, and instrumentalities of the United States to display the flag of the United States at half-staff on Patriot Day and National Day of Service and Remembrance in honor of the individuals who lost their lives on September 11, 2001. I invite the Governors of the United States and the Commonwealth of Puerto Rico and interested organizations and individuals to join in this observance. I call upon the people of the United States to participate in community service in honor of those our Nation lost, to observe this day with appropriate ceremonies and activities, including remembrance services, and to observe a moment of silence beginning at 8:46 a.m. eastern daylight time to honor the innocent victims who perished as a result of the terrorist attacks of September 11, 2001. Through the twisted steel of the twin towers of the World Trade Center, the scarred walls of the Pentagon, and the smoky wreckage in a field in southwest Pennsylvania, the patriotism and resiliency of the American people shone brightly on September 11, 2001. We stood as one people, united in our common humanity and shared sorrow. We grieved for those who perished and remembered what brought us together as Americans. Today, we honor the lives we lost 8 years ago. On a bright September day, innocent men, women, and children boarded planes and set off for work as they had so many times before. Unthinkable acts of terrorism brought tragedy, destruction, pain, and loss for people across our Nation and the world. As we pay tribute to loved ones, friends, fellow citizens, and all who died, we reaffirm our commitment to the ideas and ideals that united Americans in the aftermath of the attacks. We must apprehend all those who perpetrated these heinous crimes, seek justice for those who were killed, and defend against all threats to our national security. We must also recommit ourselves to our founding principles. September 11 reminds us that our fate as individuals is tied to that of our Nation. Our democracy is strengthened when we uphold the freedoms upon which our Nation was built: equality, justice, liberty, and democracy. These values exemplify the patriotism and sacrifice we commemorate today. In that same spirit of patriotism, I call upon all Americans to join in service and honor the lives we lost, the heroes who responded in our hour of need, and the brave men and women in uniform who continue to protect our country at home and abroad. In April, I was proud to sign the bipartisan Edward M. Kennedy Serve America Act, which recognizes September 11 as a National Day of Service and Remembrance. Originated by the family members of those who lost loved ones on 9/11, the National Day of Service and Remembrance is an opportunity to salute the heroes of 9/11, recapture the spirit of unity and compassion that inspired our Nation following the attacks, and rededicate ourselves to sustained service to our communities. Throughout the summer, people of all ages and backgrounds came together to lend a helping hand in their communities through United We Serve. As this summer of service draws to an end, we renew the call to engage in meaningful service activities and stay engaged with those projects throughout the year. Working together, we can usher in a new era in which volunteering and service is a way of life for all Americans. Deriving strength from tragedy, we can write the next great chapter in our Nation's history and ensure that future generations continue to enjoy the promise of America. By a joint resolution approved December 18, 2001 (Public Law 107-89), the Congress has designated September 11 of each year as Patriot Day, and by Public Law 111-13, approved April 21, 2009, has requested the observance of September 11 as an annually recognized National Day of Service and Remembrance. NOW, THEREFORE, I, BARACK OBAMA, President of the United States of America, do hereby proclaim September 11, 2009, as Patriot Day and National Day of Service and Remembrance. I call upon all departments, agencies, and instrumentalities of the United States to display the flag of the United States at half-staff on Patriot Day and National Day of Service and Remembrance in honor of the individuals who lost their lives as a result of the terrorist attacks against the United States that occurred on September 11, 2001. I invite the Governors of the United States and the Commonwealth of Puerto Rico and interested organizations and individuals to join in this observance. I call upon the people of the United States to participate in community service in honor of those our Nation lost, to observe this day with other ceremonies and activities, including remembrance services, and to observe a moment of silence beginning at 8:46 a.m. eastern daylight time to honor the innocent victims who perished as a result of the terrorist attacks of September 11, 2001. IN WITNESS WHEREOF, I have hereunto set my hand this tenth day of September, in the year of our Lord two thousand nine, and of the Independence of the United States of America the two hundred and thirty-fourth.